Silt collects on the bottoms of rivers, lakes and ponds, it is a fine sediment that is caused by the decay of organisms into the water. The build-up of silt will lead to a reduction in water depth, an increased risk of flooding and potentially the loss of the watercourse. This usually occurs in autumn when plants die back and trees lose their leaves it is also caused by run off from surrounding land as well as the decomposing of natural materials. Oxygen levels at the lake bed will diminish and organic waste will not be oxidised. Water quality will deteriorate significantly impacting aquatic flora and fauna, making desilting a vital process. In order to extend the life of a lake or body of water and promote biodiversity, it is necessary to periodically remove the build-up of silt from the lake bed. 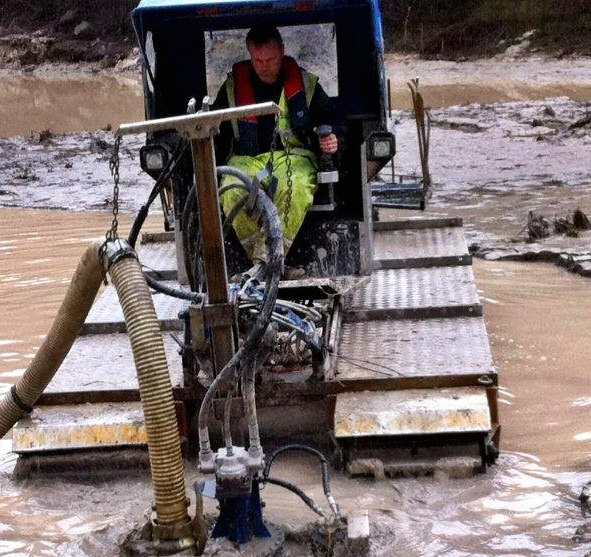 If you would like to learn more about how we can help you deal with desilting and lake dredging, please contact us and we can have an informal chat to discuss your needs. We utilise Google Earth or you can attach pictures (below) of the area to help discuss any project in more clarity and detail. All of our quotations are provided free of charge and in the case of larger jobs we would undertake a site survey. Call us on 01788 810614 or email us at info@aquatic-solutions.co.uk, or by using the online form below. We look forward to hearing from you soon.